Science for a New Year! Science is part of my DNA. I was blessed by God to have a grandfather who loved science and shared that love with me. Any of you remember Mutual of Omaha’s Wild Kingdom? Well I do! I remember being in awe over the pictures of the animals and all the really neat things about how they lived, what they ate, and the relationships between them. Along the way, I was fortunate to have teachers who inspired and nurtured my love of science. In seventh grade it was a single drop of water that confirmed I was to do something in the field of science. And in 10th grade it was a cow’s eye that sparked my desire to be a science teacher. Of course with parents as educators, teaching seemed to be in my blood. As much as I love science, I know there are other parents and teachers who can’t stand it! While I find joy in observing a wiggly decomposer (a worm) as one of my student’s described them, there are many teachers and parents who don’t like or don’t know how to get excited about it. I am saddened to learn that some schools have even taken science out of the curriculum in elementary school. But I am here to say-NO Longer! Did you know children are scientists in the making? I like to call them budding scientists. You see God gives every child the foundational blocks to become great scientists. He gives them the ability to ask questions! From the moment children begin to speak, the questions come. Did you know, according to research done by Rolf Smith, children ask over 125 questions a day! 125!!! Yep, no wonder as parents and teachers we are tired! But we should find joy in their questions. By asking those questions, they are simply trying to figure out how and why the world works. There is however, a second side to Mr. Smith’s research. You know how many questions adults ask a day? Only 6. In fact, there are some 119 questions per day that never get asked. Is it because we don’t think they matter? Or we think people won’t care? What really worries me the most is why, over the years, as children get older, do they stop asking questions? I am sure many of you can weigh in with reasons why kids stop asking questions, but what I have learned is this-it is never too late to get people asking questions! All you need is to present a child or even an adult with something weird, unusual, or even something that goes counter to what they believe, and the questions will come. So my blog this year will be about questions. Hopefully, the questions I ask and answer will help to make making science fun again. It if is fun for you, then it will be fun for your kids! And of course, I will give you the standards so you can align them to what you need to teach! If you are willing to forgive the fact I am not the best writer in the world (lots of prayers are going up about this writing thing! ), then visit my blog for ideas! Are you ready? What to do with a Pumpkin? Don’t know about you, but carving up a pumpkin is something I love to do with the kids each year! 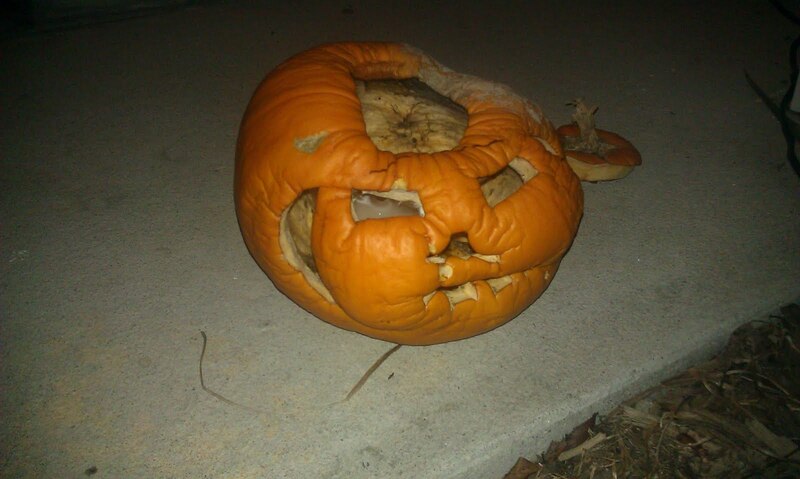 But even more than carving a pumpkin, I love to see what happens after a pumpkin begins to rot! I know this may seem strange, but science is all around us and sometimes you have to just go with it in order to foster curiosity! So, instead of throwing it out this year, turn it into a learning experience with your children! What I love about the idea is how she went with her son’s question and worked with him to find the answer. Instead of just having her son observe the pumpkin, she created a simple, inexpensive journal in which he could not only draw a picture of what he saw, but she could write for him to document his ideas! If scientists do this in their world, shouldn’t kids? Yes, they should! Imagine if you used a camera to document the decay. You could create a photo story of the event or even print the pictures out and tape them into your child’s journal so they have real pictures that show the decay. My teacher friends know I am always on the look out for activities that can be tweaked to make simple experiments for our young scientists. So how could you turn this activity into a simple experiment? It begins with thinking about what we could change about the pumpkin. Well, think about this-what about the physical properties of the pumpkin could we change that might make a difference on decomposition? What about size? Does a bigger pumpkin decompose the same way as a smaller one? Does it decay in the same rate? What about changing the type of fruit we use-so instead of using a pumpkin, because we know what a pumpkin does, how about an apple? Will an apple decompose the same way as a pumpkin? Simple experiments always involve changing one thing and then making observations or collecting data to see if that change made a difference or not. So don’t throw out the pumpkins just yet! Two years ago when I started doing early childhood workshops, I found it hard to find books to align with some of the activities I had developed. This prompted the idea of writing a book to fill the gaps. 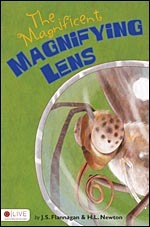 I am proud to say there is now a book about how to use a magnifying lens! My friend Heather Newton and I worked on this for several months and then we were lucky enough to find a publisher who liked the idea! Some of you may laugh at the fact the main character is named Jenny Sue, but there is a reason for this! My mother, who’s name is May Sue, grew up in Wakefield, Virginia. My great grandfather Pop Bell lived with them and used to tell my mother these great stories about a girl name Ginny Sue who lived in the woods and swung on a bullis vine. Ginny Sue went everywhere and was so smart! She could do anything! When my mother found out she did not exist (this was after my mom climbed up on the roof while they were fixing it to call for Ginny Sue to come out and play), she swore if she had a little girl she would name her Ginny Sue. So change the spelling a little and you have the story of how I got my name. But the use of Jenny Sue as the main character was not about the story of how I got my name, but more about what Jenny Sue represents. Girls can do science. They can become electrical engineers! The world can be their oyster, but they need to hear this is possible and to meet other women who look like them! So enjoy our little story!